If you do get your bike stolen from you then you could start with this list. 1) File A Police Report – The first thing many people forget to do is to file a police report. Most people forget this simple step and the truth is the police departments recover tons of stolen bikes that are never claimed. Here are the most common bike theft cities in the Bay Area. You can also register with the East Bay Bike Coalition for stolen bikes. If stolen in San Francisco Tweet to SFPD. 2) Check Around Town – There are a few local bike dumping places such as Laney Flea Market, Ashby Flea Market, San Jose Flea Market, Karim Cycles, Downtown Oakland and so on. In San Francisco you may go check down Market Street as well. 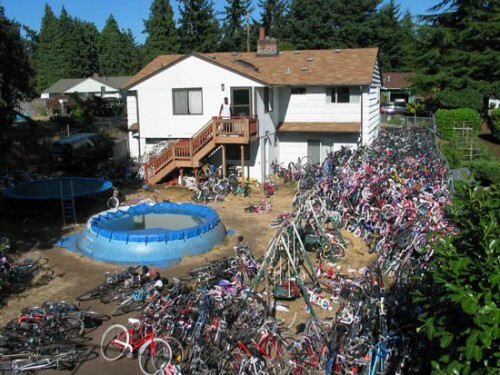 Point is, check around town and if you do spot your bike do not try to reclaim your bike. Call the police. 3) Check Online – Craigslist is a stolen treasure warehouse. Be sure to check Craigslist for your stolen bike because you just may find it. If your bike is really unique and expensive check further than the Bay Area, such as Sacramento or Los Angeles. Ebay may be a good idea too. If you do go to the flea markets be sure to contribute to the Flickr Group. And last but not least join the active Google Group. The fear of getting your bike stolen in Oakland is real and if you’re from Oakland, chances are it’s already been stolen at some point in life. When you have a nice bike and you live in an area where the crime is so high, it kind of keeps you from using that bike as often as you would like to. Which in return makes all of the bike friendly efforts worthless. Oakland is not bike friendly, you will lose your bike if you don’t adhere to a few common sense rules. 1) Best Bike Lock – Let’s face it, bike locks are expensive. This is a budget you do not want to cut corners on. Luckily you only have to do this once though. Kryptonite offers the “New York Fahgettaboudit” u-lock with a maximum security rating of 10. People swear by it but it is pricey. I myself went with the cheaper bike lock that comes with a cable. I regret it every day and fear for my bikes safety. You will need to buy a cable separately if you don’t get the combo like I did. 2) Best Way To Lock Bike! – Of course the most important thing is to lock your bike up the best way you can. You will want to be sure to lock the bicycle frame, back tire, front tire, bike seat(if you have a nice one) and use a poll that can’t be defeated. This can be achieved with one of the lock cable combos mentioned above. Watch this video for the best technique for locking your bike. 3) Register Your Bike! – While this won’t prevent your bike from being stolen, this will make it a lot easier to get your bicycle back. There are a lot of places to do so such as SafeBike. Get Your Stolen Bike Back! If you follow all of those steps to protect your bike, the preventative measure may just stop it from being stolen in the first place. However if a bike thief does get a hold of your expensive bike, just follow the steps and wish for the luck in recovering your stolen bike here in the San Francisco Bay Area. Please comment below with your stolen bike stories and details of how you got it back. If you did. Found a Next PowerX frame in my driveway this morning. What should I do to find the owner? My bike was stolen last night (10/28/15) from Ashby/College area. It was stolen from locked storage locker. This was the third attempt to get into the locker in last two months, so someone must have seen me put bike away. Bike is a 2003 Klein Q-Carbon Team road bike, orange/red, 58cm. It’s very distinctive. Mavic Kysrium Elite wheels.